The lavish scale of French grand opera is wonderfully in evidence in this production by David McVicar, set in 1870s Paris, with a large chorus, sensational sets, ballet and an ecstatic finale. 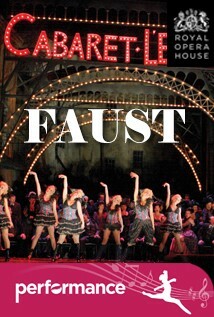 There are many versions of the story of Faust, who trades his soul with the Devil for youth and power, but Gounod’s opera remains one of the most constantly enthralling. Michael Fabiano stars as Faust, with Diana Damrau as his beloved Marguerite and Erwin Schrott as the diabolical Méphistophélès. Virtuoso leading roles, a large chorus, sensational sets, ballet and an ecstatic finale make this the epitome of theatrical spectacle – the lavish scale of French grand opera is wonderfully in evidence in this production by David McVicar, set in 1870s Paris. Above all, the music includes several of popular opera’s most recognizable numbers, performed by a cast of great international singers and the Royal Opera Chorus. The cast includes Michael Fabiano (Faust), Erwin Schrott (Méphistophélès), Diana Damrau (Marguerite). An opera in 5 acts sung in French with English subtitles. 255m approx including 2 intervals.